I absolutely adore Elf and for the most part he fits in well with our chaotic household---Maizy, the beagle, is still grumpy and grouchy about his presence but really it’s only a big issue for her when he has taken up the entire couch and she can’t find a place to sleep. Everyone at work looks forward to seeing him and I’m pretty sure that I have students who only come to one particular class because they are hopeful that he’ll be there. Even the cats have decided that they accept him and you can frequently find them sleeping together. 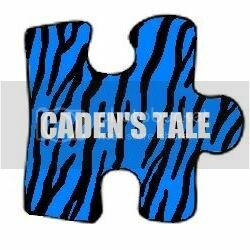 Honestly though I have been wondering what role Elf really plays in Caden’s life. Thankfully we haven’t had to worry about seizures for a few years so he doesn’t actively alert like those dogs on a regular basis although he does tend to let us know when Caden isn’t feeling well. Given how quickly Caden throws up, I’m thankful for any advance warning that we can possibly get so if Elf starts licking Caden’s mouth, we grab towels STAT. Although it only takes once, Caden hasn’t really gotten away from us or out of the house since Elf has come home so other than practice hide and finds Elf hasn’t had a “real” search and rescue to deal with. Behavior disruption hasn’t gone exactly the way we hoped either. Elf definitely knows when there’s a problem (then again the entire neighborhood probably knows given how high pitched Caden’s screams and cries go when something isn’t right in his world and lately there hasn’t been a lot going right given the sheer number of meltdowns we are dealing with) and he tries everything he knows—lap, licking, pawing, nudging, etc. But Caden doesn’t seem to respond to any of those; in fact if he’s truly melting down (and not just having a kid moment of let’s see if crying gets me anywhere) Elf’s efforts tend to upset him even more. I’m hopeful though that over time Caden will start to realize that Elf is trying to help him and he’ll be more receptive to Elf’s efforts. Don’t get me wrong, it is absolutely amazing how Caden immediately grabs ahold of Elf’s harness when we are in public and he usually doesn’t let go unless we tell him that he can. Of course we’ve told him that he’s helping us keep Elf from getting lost but he takes the task very seriously and whatever works, right?!?! And I think having a service dog is like a neon flashing sign for most folks that there is some reason why Caden must need a service dog so people seem to be a bit more accepting of “odd” behaviors. Of course they also move out of our way because you’d only have a service dog if you are blind….heck everyone knows that! I started to notice a few things such as Caden isn’t only holding onto Elf in public but he’s running his hands through Elf’s fur to calm himself down when he’s nervous and would probably otherwise try to flee public interactions or situations that make him nervous—this might be why we haven’t had to utilize the search command yet. When Ryley had a friend over to play a few days ago, Caden wanted to play but he didn’t know how to inject himself into the game so he used Elf as his social bridge. Caden is practicing so hard on some of his commands because he wants Elf to go with him and show others his “tricks” and be able to tell Elf when he wants him to come upstairs or downstairs or outside. They sleep together every night and if for some reason we put Elf in his kennel during the day Caden wants to know why. He tells us when he thinks Elf is sad which is pretty huge for a child who can’t recognize emotions in other people. He even drew a picture of a bone so that Elf could have it without any prompting from us. And then there was the deal clincher…… Caden announced to me that “Elf is the very bestest friend that he’s ever had.” I can’t think of any better explanation or reason for them to be together than for a child with autism to know and be confident in the fact that he has a very best friend who is always there for him---this become more and more every day the true story of a boy and his dog. “Real” pictures (aka the ones taken by someone who gets to call themself a photographer) are rare in our household these days. Honestly I have a lot of guilt over this. When Ryley was small, I had her pictures taken all of the time—seriously every month the first year of her life and then every 3 months or 6 months as she got older. She loved having her picture taken and I loved the process of having her picture take. The only stress was when it came time to pick out the pictures because they were usually all pretty darn good (and yes I am totally biased). That was my intention when Caden was born but between medical procedures that taught Caden to distrust any setting that he wasn’t familiar with particularly if he was being laid on a table, and autism’s predisposition to avoiding being touched by strangers, coaxed to smile on cue with required eye contact, and the obnoxious sounds that photographers make in an attempt to get the perfect smile, Caden hated the entire picture process. Eventually for everyone’s sake we stopped trying but that doesn’t stop me from wishing, dreaming, and honestly getting down right jealous when friends post their pictures on facebook. So when school pictures rolled around this year I decided to keep my expectations low. I wasn’t going to get disappointed if Caden chose his Mario shirt over the cute polo I had picked out with pictures in mind over the summer. I wasn’t going to get upset over the fact that I was cutting Caden’s hair while his friends were getting trims from professionals in anticipation of the big day. I even vowed and stated to his teacher that the picture wasn’t that big deal, what really mattered was him not getting overwhelmed or afraid in the process. Much to my shock Caden liked the shirt I had picked out, put it on, and wore it the day of pictures without a single complaint about the collar. Thankfully I managed to trim his hair somewhat evenly and he didn’t even have any oops on his forehead or ears (Before those of you without children who have autism pass judgment on this one try this little experiment first. Take your child the night before their birthday and give them an entire bag of pure sugar and let them wash it down with some caffeine. Then lather them up with grease—any variety will do. Your job while they run uncontrollably around the house it to get the scissors close enough to their hair to chop at it while trying not to cut said child. For added fun have someone else run in and out of the rooms, shouting the child’s name so that you can get lots of head jerks and unsuspected movements to really challenge your scissor skills. Now pass judgement…go ahead…yep that’s what I thought). He was even a little excited about pictures, particularly the class picture with his friends. His teacher texted me later that morning and said things went well. No meltdowns, no 911 calls, and no crying/screaming child yields a pretty good day in our world. When pictures came back a few days ago, I was pretty darn speechless. His picture is good—he doesn’t have that vacant stare that he’s known to adopt when forced to smile or “look this way” and his class picture is precious. Even more special than the picture is listening to Caden talk about “his friends” and the fact he wants the picture framed and hung up in his room. I should mention before child #1 loudly states "it's not fair" in the special way that only an 11 year old daughter can, that Ryley's pictures were beautiful and made me a little sad to see how much she's grown up in the last few years.